High Brow Cat | That’s a Wrap! It’s hard to believe that the 2017 Futurity has already come and gone! We had a great time catching up with everyone and seeing some incredible horses! We would like to congratulate Austin Shepard on his Futurity win! He is a good friend and avid supporter of our program. We were thrilled to see him have such an amazing 2017! 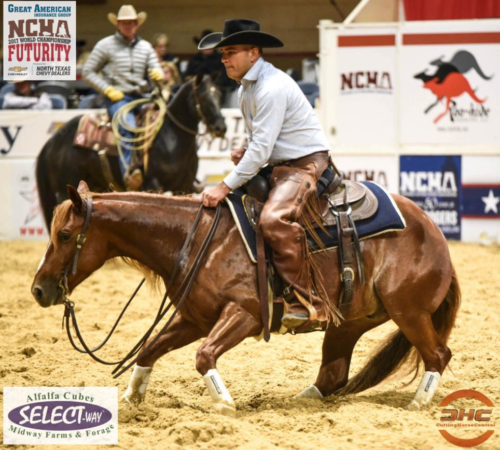 Cat is the proud sire of three Open finalists this year – Judgement Day, ridden by Michael Cooper and owned by Rose Valley Ranch; Little Jo Cat, ridden by Pedro Ornelas and owned by Steve and Michelle Anderson; and Candi Cat, ridden by Spud Sheehan and owned by Beechfork Ranch. Little Jo Cat also won the Limited Open with Pedro AND made the Non-Pro finals with Steve! We’re excited to see all of these talented horses continue on with their show career in 2018!